NASA's Opportunity rover has demonstrated some rocks on Mars probably formed as deposits at the bottom of a body of gently flowing saltwater. 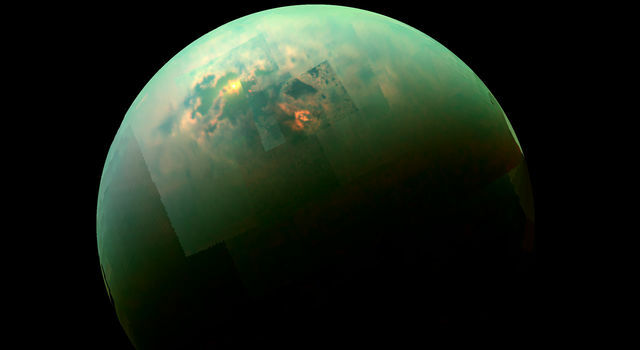 "We think Opportunity is parked on what was once the shoreline of a salty sea on Mars," said Dr. Steve Squyres of Cornell University, Ithaca, N.Y., principal investigator for the science payload on Opportunity and its twin Mars Exploration Rover, Spirit. Clues gathered so far do not tell how long or how long ago liquid water covered the area. To gather more evidence, the rover's controllers plan to send Opportunity out across a plain toward a thicker exposure of rocks in the wall of a crater. NASA's Associate Administrator for Space Science Dr. Ed Weiler said, "This dramatic confirmation of standing water in Mars' history builds on a progression of discoveries about that most Earthlike of alien planets. 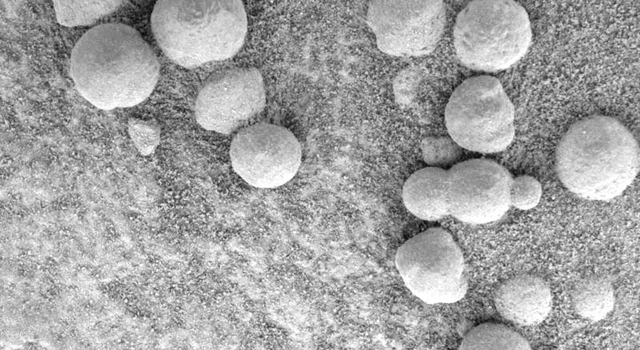 This result gives us impetus to expand our ambitious program of exploring Mars to learn whether microbes have ever lived there and, ultimately, whether we can." "Bedding patterns in some finely layered rocks indicate the sand-sized grains of sediment that eventually bonded together were shaped into ripples by water at least five centimeters (two inches) deep, possibly much deeper, and flowing at a speed of 10 to 50 centimeters (four to 20 inches) per second," said Dr. John Grotzinger, rover science-team member from the Massachusetts Institute of Technology, Cambridge, Mass. In telltale patterns, called crossbedding and festooning, some layers within a rock lie at angles to the main layers. Festooned layers have smile-shaped curves produced by shifting of the loose sediments' rippled shapes under a current of water. "Ripples that formed in wind look different than ripples formed in water," Grotzinger said. "Some patterns seen in the outcrop that Opportunity has been examining might have resulted from wind, but others are reliable evidence of water flow." According to Grotzinger, the environment at the time the rocks were forming could have been a salt flat, or playa, sometimes covered by shallow water and sometimes dry. Such environments on Earth, either at the edge of oceans or in desert basins, can have currents of water that produce the type of ripples seen in the Mars rocks. A second line of evidence, findings of chlorine and bromine in the rocks, also suggests this type of environment. Rover scientists presented some of that news three weeks ago as evidence the rocks had at least soaked in mineral-rich water, possibly underground water, after they formed. Increased assurance of the bromine findings strengthens the case that rock-forming particles precipitated from surface water as salt concentrations climbed past saturation while water was evaporating. Dr. James Garvin, lead scientist for Mars and lunar exploration at NASA Headquarters, Washington, said, "Many features on the surface of Mars that orbiting spacecraft have revealed to us in the past three decades look like signs of liquid water, but we have never before had this definitive class of evidence from the martian rocks themselves. 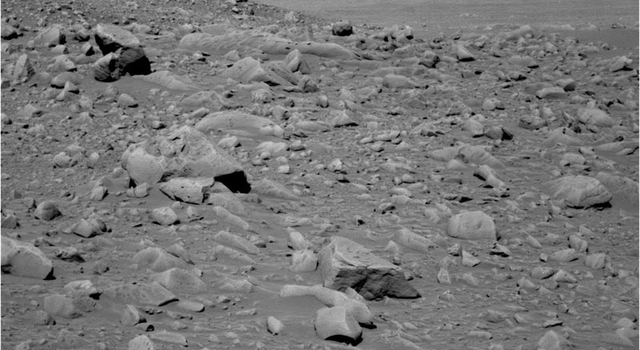 We planned the Mars Exploration Rover Project to look for evidence like this, and it is succeeding better than we had any right to hope. Someday we must collect these rocks and bring them back to terrestrial laboratories to read their records for clues to the biological potential of Mars." Squyres said, "The particular type of rock Opportunity is finding, with evaporite sediments from standing water, offers excellent capability for preserving evidence of any biochemical or biological material that may have been in the water." 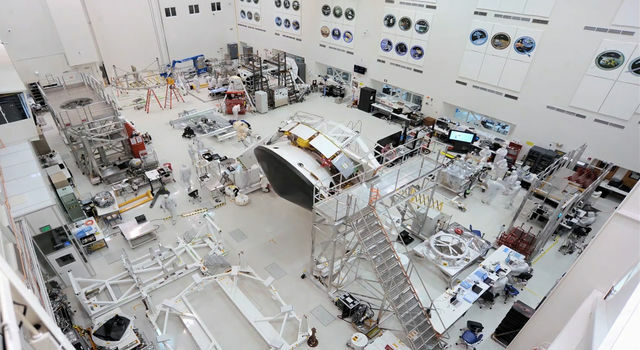 Engineers at NASA's Jet Propulsion Laboratory, Pasadena, Calif., expect Opportunity and Spirit to operate several months longer than their initial three-month prime missions on Mars. To analyze hints of crossbedding, mission controllers programmed Opportunity to move its robotic arm more than 200 times in one day, taking 152 microscope pictures of layering in a rock called "Last Chance." JPL, a division of the California Institute of Technology in Pasadena, manages the Mars Exploration Rover Project for NASA's Office of Space Science, Washington. Images and additional information about the project are available on the Internet at http://www.nasa.gov, http://marsrovers.jpl.nasa.gov and http://athena.cornell.edu .